For Me, From Not-the-Easter Bunny! Earlier today I had to make a mad dash over to the pet store to buy cat food for Geronimo and since it’s right next door to Whole Foods, I thought I’d pop in to buy a small wheat roll to go with my dinner salad. But as soon as I walked in, there it was, tempting me: the Easter display. My growing-up family, though not particularly religious, observed some Easter traditions: my Mom would make lacy pastel frocks for my sister and me, we had the egg hunt and pretty baskets and, when I got older, my mom always bought me one of those huge See’s chocolate eggs, decorated with frosting. Now, every year on Easter Eve, I get a craving for special treats. Though this made no sense at all, the gracious clerk smiled broadly and said she TOTALLY understood (really?) and then said, excitedly, “Ooh! I know! Wait right there!” I laughed and said I would, she went running to the back. 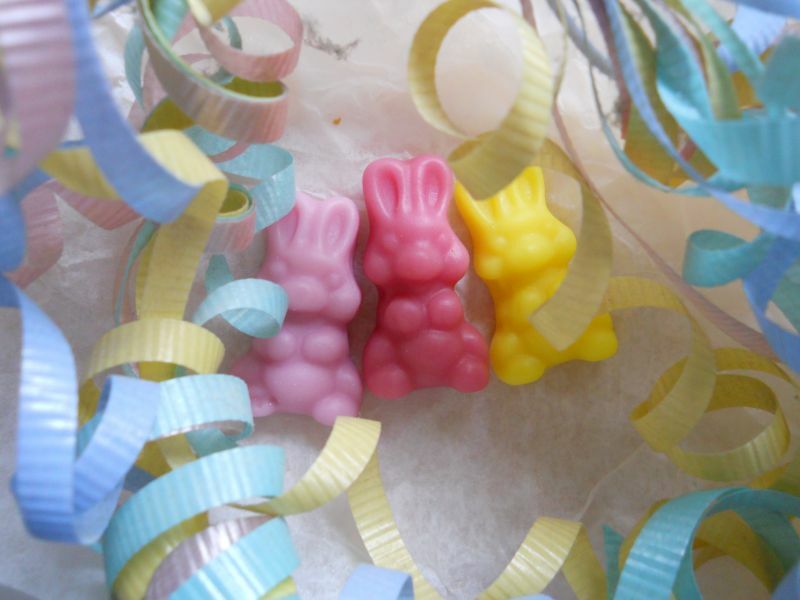 I saw her fussing with something, and when got back to the counter she shyly held out to me a crumpled square of waxed paper in which were nestled three adorable candy bunnies. They were perfect in every way. I smiled, and she smiled. I took the tiny sugar-warren, wrapped them, thanked her profusely, and left happy. I think she was even happier. The true theme of Easter is so much larger and deeper than anything having to do with candies or bunnies; nevertheless, an important aspect of the holiday was very much present in our encounter: joy. In this case, the joy of intuited need and fulfillment, the joy of grace, and giving, and gratitude.